Some movies wait until well into their running times before they declare the true natures of their wretchedness; others, like the laughably incoherent Gymkata, proudly display the dismalness to come from minute one. This, along with the somewhat better American Anthem, prove that Olympic gymnasts should forever refrain from trying to make it big in the movies. Our gymnast this time is Kurt Thomas and he stars as, yes, an Olympic gymnast; however, he's now being recruited for an even bigger assignment. You see, in the fictional nation of Parmistan, the United States wants to place a strategic anti-missle system, but enemy countries want power over Parmistan. The Khan of Parmistan is trying to bring his country into the 20th Century, but his closest aide, the odious Zamir (he of the terrifying feathered hair and gold earring) is secretly trying to overthrow him. Got that? Ok, well everything hinges on 'The Game', of which the winner is granted one wish, and it seems that America's only hope of succeeding in 'The Game' is by training Thomas. Still with me? What is 'The Game', and how is it possible to train for it? The screenplay helpfully tells us that 'The Game always changes', therefore, nobody knows, not even the film-makers, but that doesn't stop the Princess of Parmistan from making an appearance to help Thomas in his training (we are told that 'The Princess has a very interesting background'. Why is it interesting? "Her mother was from Indonesia. "), which seems to consist of walking up stairs on his hands, mastering monkey-bars and avoiding the Princess's knives. Whew! Oh, but wait, there's more! It seems that Thomas's own father participated in 'The Game' but was never heard from again. Before Thomas and the Princess make their way into Parmistan, they are told "You must first enter the port city of Karabal on the Caspian Sea", which is helpfully followed by a shot of the city with the title card "The Port City of Karabal on the Caspian Sea"...uh, thanks, but I think we got that. During their stay there are double-crosses by enemy agents, a kidnapping and some fight scenes between Thomas and some thugs. Luckily for Thomas there is always a convenient high-bar installed in any alley so he can get to do some Gymnast-Fu...or, Gymkata (the title which is strangely never mentioned once in the entire movie). Finally we get to Parmistan and finally we get to 'The Game' which is an unremarkable obstacle course that is only truly dangerous because of Zamir and his soldiers who follow the players and shoot arrows at them...or should I say, shoot arrows at anyone who is not Kurt Thomas. And yet they can never understand how Thomas keeps surviving their onslaughts. 'The Game' finally reaches its friggin' endless climax within the 'Village of the Damned' (disappointedly, this town is only filled with crazy, homicidal maniacs and not white-haired children with psychic alien powers) where Thomas defeats the maniacs with the help of a convenient stone pommel horse and the sudden appearance of his long-lost father. Thomas wins 'The Game' and gets the hand of the Princess, Zamir is defeated, and the United States gets their missle base. All is right with the world. Gymkata is stupifyingly inane from the first frame to the last. And when it's not being inane, it's simply incoherent, incomprehensible and inept. You practically need an interpreter to even understand what's going on half the time because here is another case of a movie without any rules or logic and that anything can happen to anyone at any time for any reason. So why bother trying to follow the story? It may be adapted from a novel (The Terrible Game by Dan Tyler Moore), but I bet a whoooooooole lot of liberties were taken. I would make a special mention about Kurt Thomas's lousy bit of acting, but that would indicate that anyone else in it was any better...and they're not. 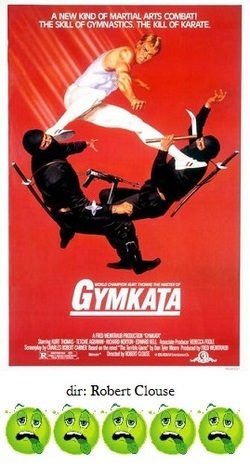 I would say that Gymkata almost qualifies as a 'so bad it's good' kind of movie. Thomas's Olympic teammate Mitch Gaylord may have been in a better made film in American Anthem, but the silliness on display in Gymkata is much more entertaining than all of the angst in that one.